The TRACTkote® coating system for traction and diverter sheaves have been developed together with leading companies in the lift industry and has been used to prolong the life of sheaves. » Read More.. 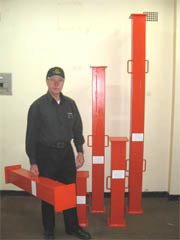 The props have Work Cover Authority approval in NSW, VIC, QLD, SA and WA for a safe working load of 4,000 and 10,000kg. The props are currently available in standard lengths and non standard props also are available on request. The aluminium prop will provide light weight and stable predictable means of supporting the counterweight of lifts and similar structures. 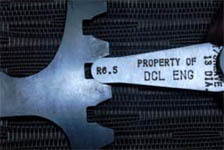 The light weight construction of these aluminium props means that two people can easily carry and manipulate the prop onto site. Essential in prolonging rope and sheave life. Easy and effective tool to use. Quick identification of rope groove conformance. Low price tool for a long life performance of rope and sheave. If you have any questions or require pricing in regards to any of our products please contact DCL.